It may sound weird that you have to learn crossing the street. Once you set foot in Vietnam, especially cities like Hanoi or Ho Chi Minh City, soon enough you will understand why. The traffic in major cities is a nightmare for many, including Vietnamese. Chances are, you will see people cross the street anytime they want instead of walking all the way to the zebra-crossing. There’s little point waiting at the side of the road for a gap in Vietnam city traffic so you can cross over because that gap will never come. Whether you’re in Saigon or Hanoi, the omnipresent tangle of snarling traffic at every turn made crossing the road seem like a particularly effective way to commit suicide. 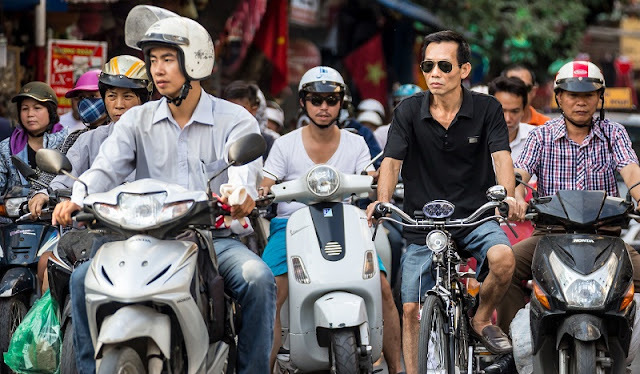 For those who come to Vietnam for the first time, the incredible volume of motorbikes on the road, added by car and non-name vehicle maybe intimidating. You want to get to the other end of the street but it does not look quite feasible. Unless you try it. Crossing over the jam is actually not that bad. You will just have to do it. The magic is that no-one will ever run into you. The relatively small size of the vehicle, the unobstructed view and especially the riders’ experience in managing around the city mean that they will take caution in the road, at least to avoid crashing into any walking-by passengers. The rule of thumb is that do not rush over to the other side of the street. If you observe carefully, you will see that most Vietnamese walk very slowly as they cross the street to allow time for moving vehicles to avoid any potential crash. You can read more about why I think Hanoi, Vietnam is one of the most bewitching cities in South East Asia – despite the traffic.